Upland bird hunting is one of the most popular kinds of bird hunting. Most hunters enjoy this method because there are a lot of benefits to it. Since it’s so popular, the use of dogs has skyrocketed. In fact, bird hunting dogs do their best in upland conditions. If you would like to know what it is and how using them can help, read on. Upland bird hunting refers to the type of birds and surroundings that are being hunted. There are two different kinds of game bird, ones that live in water, and ones that don’t. Upland bird hunting refers to the birds that live out of water. Hunters prefer this kind of hunting because they don’t have to worry about getting wet. Wading around in marshes and ponds all day can become very miserable. The upland style of hunting is much more comfortable because the conditions are nicer. Most upland hunting is done in prairies and forests. Some upland birds that can be hunted in these conditions are pheasants, grouse, and quail. These birds hide in the undergrowth of the prairie and forest. That’s where they sit and wait. In these situations, upland dogs are very helpful. When hunting upland birds that hide in undergrowth, the strategy is to flush them out of their hiding spot so that you can shoot them as they fly away. The problem here is that if you are doing the flushing out, you will rarely have time enough to aim and shoot after it starts flying away. Upland bird hunting dogs are a very big help here. They can find birds a lot better than humans because of their keen sense of smell and excellent eyesight. When they get in an area, they can sense where the pheasant or quail is hiding. If you watch your dog closely, you’ll be able to tell when they’ve found a bird. Ready your gun and have it pointed in the area above where your dog is pointing. Let the dog flush the bird out and shoot the bird when it flies away. While the dogs are flushing birds out of their hiding places, they let their owners be ready to shoot. This is the main reason why people use the dogs in the first place. It makes it much easier to find the birds and shoot them. Make sure that your dog is trained in this kind of hunting strategy. You don’t want your dog running around willy nilly scaring up everything all at once. 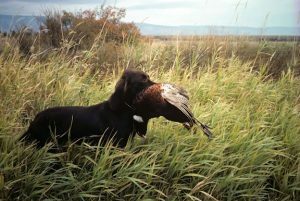 The best upland bird hunting dogs are the ones trained in this kind of hunting.